This post is all about continuing with introducing you further to Sri Lankan cuisine. Although it may seem daunting with the number of different spices and components, a bit of early prep will help make the process a lot easier and much more enjoyable! This post is about a Sri Lankan take on the traditional Chinese dish of Garlic Stir Fried Kang Kung, as well as popular tangy brinjal/ egg-plant dish, called Brinjal Moju. 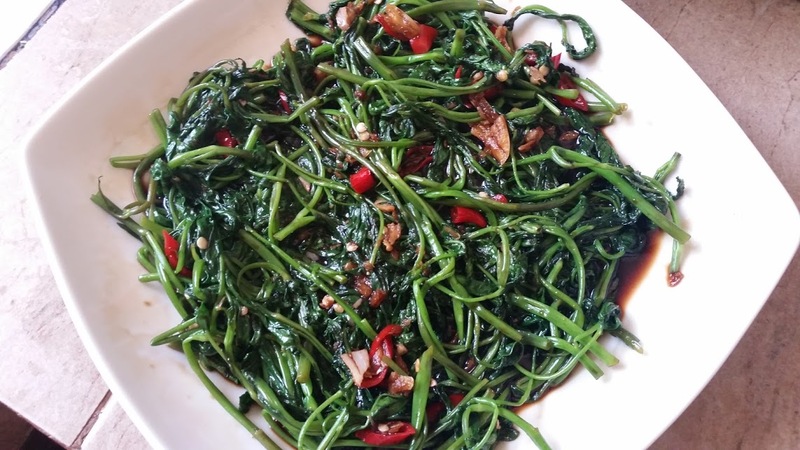 Kang kung or water spinach is readily available and one of the easiest greens to cook! The key to delicious, crunchy green kang kung is adding it to the spice mix/ sauce right at the end. A couple of minutes of pan tossing and you’re good to go! In a large pan, heat the oil and add the garlic, onions, cinnamon, turmeric, chillies and chilli flakes. Toss together, and then add in the soy sauce, tomatoes (if using) and maldive fish. A few seconds later add in the kang kung ( I sometimes add them in stages, without keeping too much time in between additions) and mix well with all the spices. Cook for a minute and remove off heat. This dish is also called “Batu Pahi” in Sri Lanka. 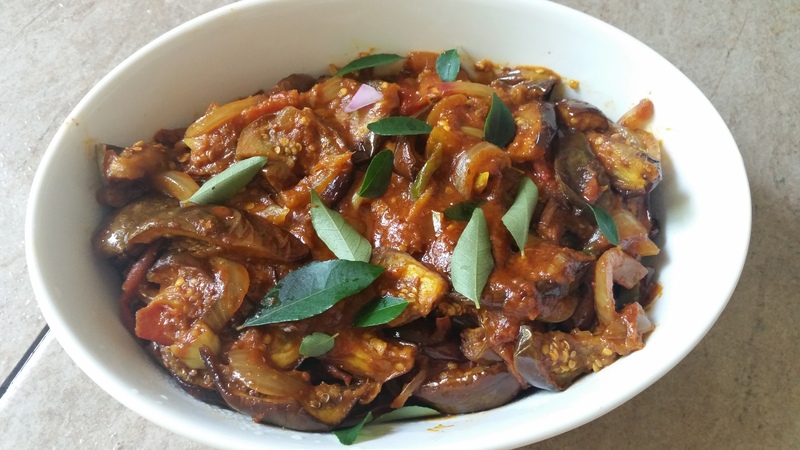 It is a sort of devilled/ pickled eggplant curry, that is delicious as a main/ side dish accompanying the traditional Sri Lankan meal. Deep fry the eggplant pieces, until golden brown. There are several types of eggplant available in the market, and any of them are suitable for this dish. In a pan, heat the oil and add the garlic/ ginger, onions, chillies, curry leaves and cinnamon. Fry lightly. Add in all the spices and mix well. Season with salt. Then add the sugar and vinegar. Cook for about a minute on a low flame. Add in the brinjals and mix well. Cook on a low flame for 1- 2 minutes, to allow the brinjals to absorb all the flavour. Serve, garnished with a few curry leaves.